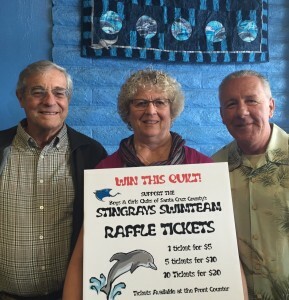 Silver Dolphin Board Members Joe Caeser, Sandy Cohen and Doug Boling stand in front of the quilt made by fellow board member Ann Rauen, which will be sold through a drawing to support the Stingrays Swim Team and swimming classes. Silver Dolphins, a swimming organization for seniors, meets three times per week at the Downtown Clubhouse to use the indoor heated pool, where the group offers water aerobics and lap classes. For the first time, the Silver Dolphins organized a fundraiser that will benefit the Boys & Girls Clubs of Santa Cruz County’s Stingray swim team. Doug Boling, board president of the Silver Dolphins, said he expected the organization, which has about 90 members, could raise about $250. But the club actually has raised nearly $700 and hopes to double that amount by selling drawing tickets for a dolphin quilt stitched by Silver Dolphin member Ann Rauen. The drawing for the quilt will be June 30. Tickets are available at the front desk of the Downtown Clubhouse, where the quilt is on display. Raffle tickets are one for $5, three for $10, five for $15 and 10 for $20.